A year or so ago I wrote about my caffeine corner, the place where I find energy in the morning. 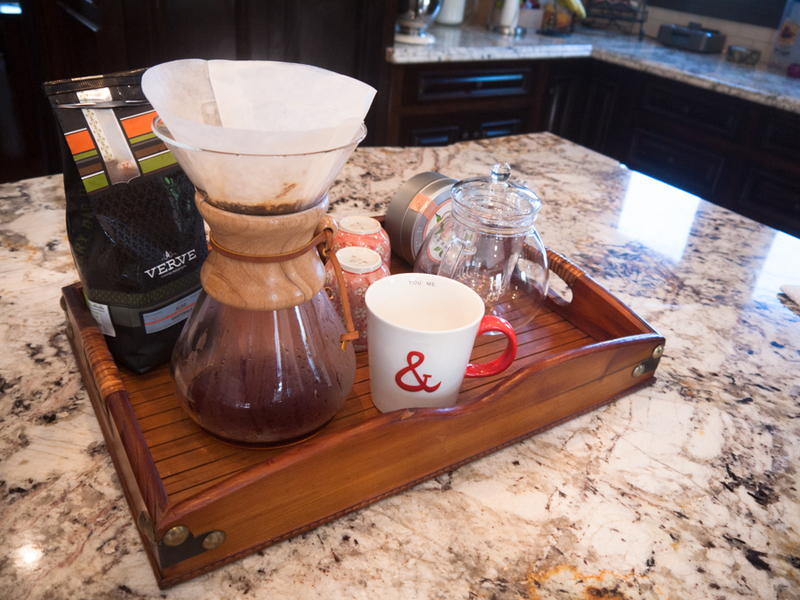 My morning coffee routine has changed a lot, and continues to change all the time. During the summer I favored making large batches of cold brew coffee and just pouring in the morning with some Starbucks Vanilla syrup and some half and half, but as the first day of fall finally struck here in Southern California two weeks ago, I woke with a shiver and realized that there is, after all, a place for hot coffee in my life. I’ve begun to favor stronger, more full-bodied coffee these days, and my pod espresso habit was no longer working for me. Due to the terrible influence of my friend D, I ended up looking into a variety of methods to brew coffee and landed on my current routine. I thought I’d take some photos of this updated “coffee corner” (some days I drink tea, though!) for you all, because I don’t take nearly enough advantage of my beautiful kitchen in this blog. I’ve had my favorite ampersand (&) mug from Starbucks for a while now and I wanted it to become “my mug” and the center piece of my coffee corner. 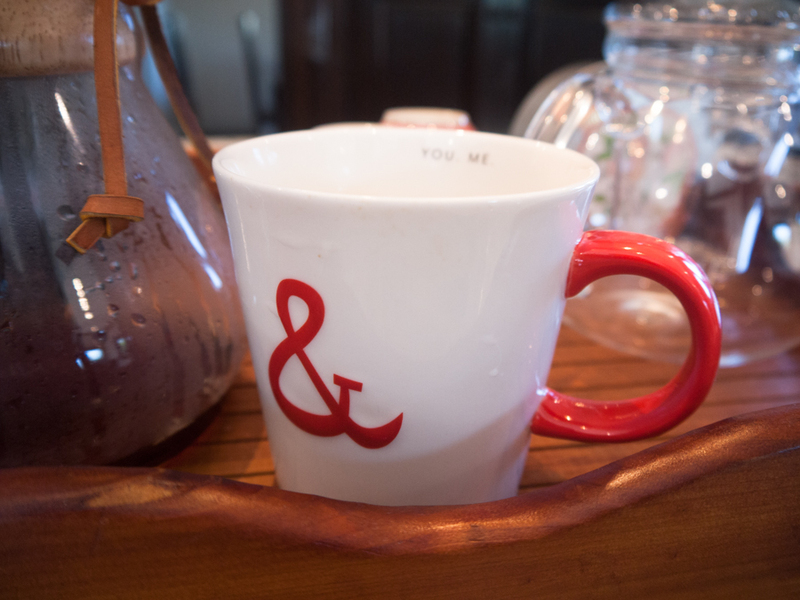 The ampersand happens to be my favorite shape in the English language, and the bright red and white contrast of this mug is perfect for fall and will carry me nicely into the holidays! I wish I had gotten a second one of this… or a third… or a fourth.. just in case something happens to this one! The Chemex coffee maker (Chemex 8-Cup Classic Series Glass Coffee Maker) is what I ended up purchasing because I realized a nice smooth drip will be the happy compromise between my usual sugar’ed and creamed up espresso lattes (I’m trying to dial back on my sugar and cream intake, because I don’t want to die an early death), and as I have been playing with this awesome coffee maker this week, I find myself drinking it closer and closer to black. I probably never will go to black coffee all the way though, because, well, I like cream and sugar… The Chemex coffee maker really is a beautiful piece of equipment and so far I’m pretty happy with it. I definitely recommend it! A few months ago I also purchased a beautiful glass teapot on Amazon.com, and I love to use it with my favorite tea, the peach blossom oolong from Lupica, which I’m almost out of (I’ve got enough for maybe two tiny cups) and desperately need to purchase. The cute little pink cherry blossom cups are from Daiso, my local Japanese dollar store for $1.50 each. I still have my old espresso corner from last year, but I use it far less often and have been enjoying hot brewed coffee every morning. As we go into winter this will probably change, but for now this is where my caffeine addiction has taken me! Previous PostPlaces: Miette.Next PostSlowing down.